It was agreed that we wouldn’t be driving far today. In fact we did very little today. Spoke to Hazy for a while and compared blue skies. Discussed gardens and Christmas plans, yes, Christmas plans already! Started a wee bit of painting from Skye and in the style of one of the paintings I’d seen in the “Biscuit Tin”. Never quite got it finished because, as you’ve probably guessed today was the day for writing up the blog posts and posting the photos on Flickr. Put a pair of headphones on to drown out Gems and just got on with it. Maybe tomorrow I’ll get round to finishing the painting and restarting the Apple Gallery. 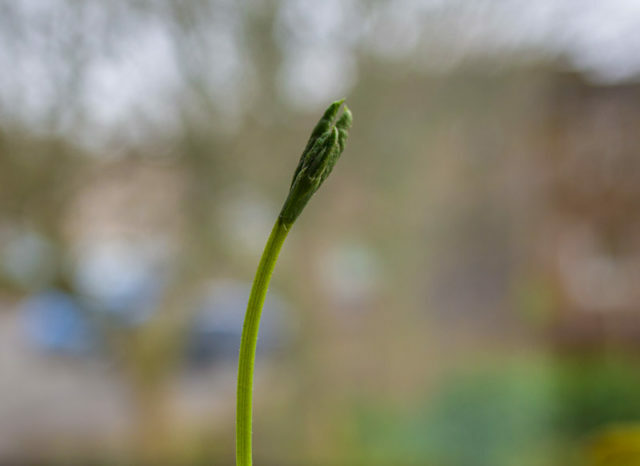 Also grabbed a shot of one of Scamp’s sweet pea plants which is just forming its first ‘real’ leaves and that became PoD. That’s the result of being too lazy to go out. Tomorrow I must gee myself. Salsa tonight was good fun as usual. Six thirty class has now moved on to level 2 and are Improvers. They were doing Enchufé tonight. In the advance class at 7.30 the ‘new’ old move was Swish along with the others we’d been doing last week. That’s about it. Tomorrow we’re going for the ‘messages’. Wild weather forecast.